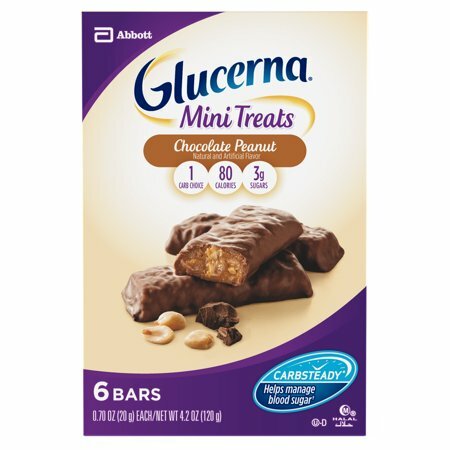 We're giving our bars a packaging refresh and a new name so for a limited time, you may receive Glucerna Mini Snack Nutrition Bars or Glucerna Mini Treat Bars. It's still the same great bar, just with a new name. Please call 1-800-227-5767 if you have questions about the product you received. I have had type 2 diabetes for at least 8 years. A diabetes nurse educator advised me that a bedtime snack may be very helpful to control overnight glucose levels. Also, there is a risk of hypoglycemia if you don't eat often enough. Glucerna bars travel easily and are a good source of snacks. I've tried many of the flavors and my preference is chocolate peanut. I'd encourage anyone with diabetes to try different flavors to find out which one(s) they prefer. I have a Chocolate Caramel Glucerna mini treat between breakfast and lunch while I'm at work. They taste great and help me control my blood sugar and cravings. Very good for a snack!!! Being diabetic is no fun, so many restrictions but these bars don't taste like I'm depriving myself. The bars are so good I can go overboard. Great tasting, wish they cost less or give us more for our money. With so many people being diabetic why do we have only one company making quality products? Please come up with a lower price point product with the same quality. How many total carbs in one Glucerna Mini snack bar? 1. Three grams of sugar, per bar. What is the sugar content in Glucerna Snack Bars?